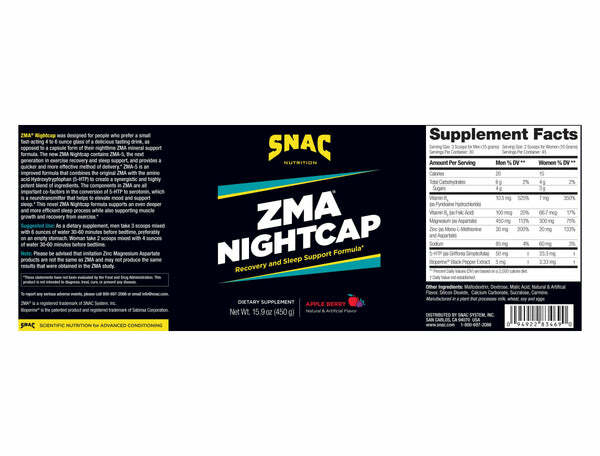 ZMA® Nightcap was designed for people who prefer a small fast-acting 4 to 6 ounce glass of a delicious tasting drink, as opposed to a capsule form of their nighttime ZMA® anabolic mineral support formula. The new ZMA® Nightcap contains ZMA®-5, the next generation in recovery and sleep enhancement, and provides a quicker and more effective method of delivery. 5-HTP has been shown to significantly increase REM (rapid eye movement) sleep while simultaneously increasing SWS or slow-wave sleep (deep sleep stages 3 and 4) and without increasing the duration of total sleep time. The benefits of REM sleep have been shown to include cognitive function enhancements such as improved problem solving ability and memory. Adequate SWS and REM sleep are both essential to the various functions of the sleep process. ZMA®-5 is an improved formula that combines the original ZMA® with the amino acid 5-Hydroxytryptophan (5-HTP) to create a synergistic and highly potent blend of ingredients. The components in ZMA® are all important co-factors in the conversion of 5-HTP to serotonin, which is a neurotransmitter that helps to elevate mood and enhance sleep. 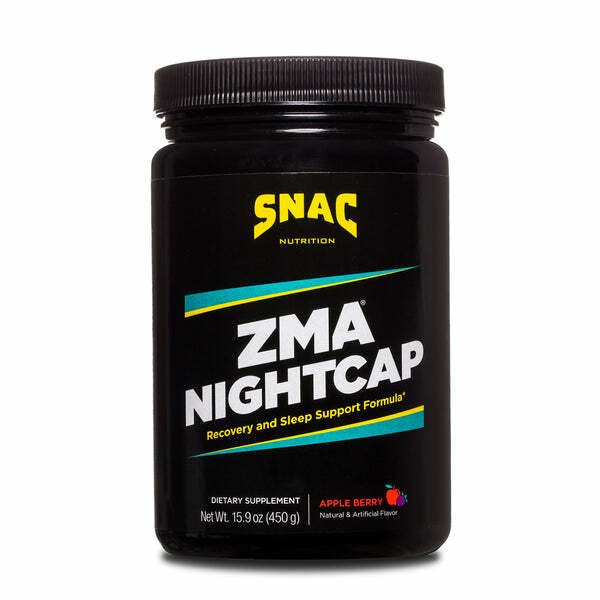 This novel ZMA® Nightcap formula promotes an even deeper and more efficient sleep process while maximizing healing, tissue repair, anabolic hormone production, and muscle growth. I love this product. For years after after all my workouts I had trouble sleeping. Since I’ve been taking ZMA, I sleep like a baby. This product is amazing. This product boost your sleep recovery. You become sleepy within 30 minutes of taking it and you wake up energized, alert and recharged. A GREAT TASTING PRODUCT THAT HELPS ME SLEEP BETTER AND RECOVER AMAZING. ONE OF THE BEST SUPPLEMENTS EVER. Great product I take it every night before I got to bed regardless if I only have time for 3 hrs or sleep or a full eight or more. I ALWAYS WAKE UP READY TO TAKE ON THE WORLD MENTALLY AND PHYSICALLY!! !